App updates is an important thing for your Smartphone. There are many issue’s will be solved with the help of app updated. There are two ways to update the apps either manually or automatically. In this guide we have to discuss how to turn on or turn off automatic app updates on smartphone. Most of the smartphone users don’t aware to keep updating his apps manually. If you feel that you don’t have enough time or forgot to update his phone apps then you have to use automatic app update method. After turn on automatic app updated all apps are updated automatically. How to Turn On or Turn Off Automatic App Updates on Smartphone. You can also set parental lock on your apps from Google Play Store to protect your phone with others. to turn on or turn off automatic app updates on Smartphone. connection to enable the automatic app updates on your Smartphone. It will take some time to properly update all the apps of your Smartphone. Google Play Store allows you to download, install and update the apps as per your need. But sometime you have to face different error cods on Google Play store during installation or updation the apps. Step 1: Tap on the Google Play Store icon from your Smartphone. Tap on the three horizontal lines which is located on the top left corner of Google Play Store window. Step 2: Locate and tap on the “Settings” > Tap on the “Auto-update apps” option and turn on “Auto-update apps over Wi-Fi only” option. Now, when your phone receive any app update then app updation process is started at your smartphone. Most of the person does not like to update the apps on his smartphone. If you don’t want to update your apps ten you can easily turn off automatic app update from your phone. 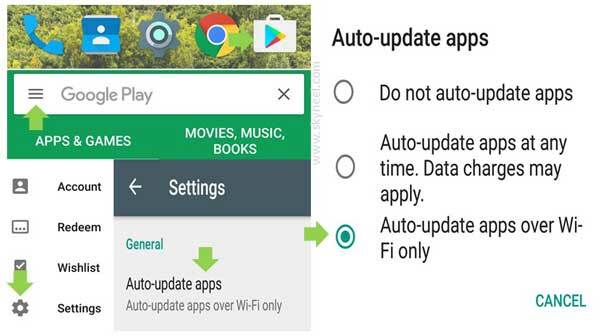 If you want to turn off automatic app updates on your Smartphone then you have to take few simple steps, have a look. Step 1: Tap on the Google Play Store icon from your Smartphone. Now, Tap on the three horizontal lines. This icon is located on the top left corner of Google Play Store window. Step 2: Tap on the “Settings” option and again tap on the “Auto-update apps” > Now, tap on the “Do not auto-update apps” option from your smartphone. Hopefully this guide is helpful to know how to turn on or turn off automatic App updates on Smartphone. We have to recommended that you have to update all the apps of your phone. Because updated apps not only fix the bugs but also increase the phone performance also. If you have any suggestion then write us in the comment box. Thanks to all.